If you have cloudy vision or glare that affects your driving, reading, or everyday activities, you may be suffering from cataracts. Here at Reeve-Woods Eye Center Drs. Robert Reeve, David Woods, and Robert Carter are highly regarded ophthalmologists in Chico. Our eye doctors provide comprehensive cataract care including treatment and surgery. 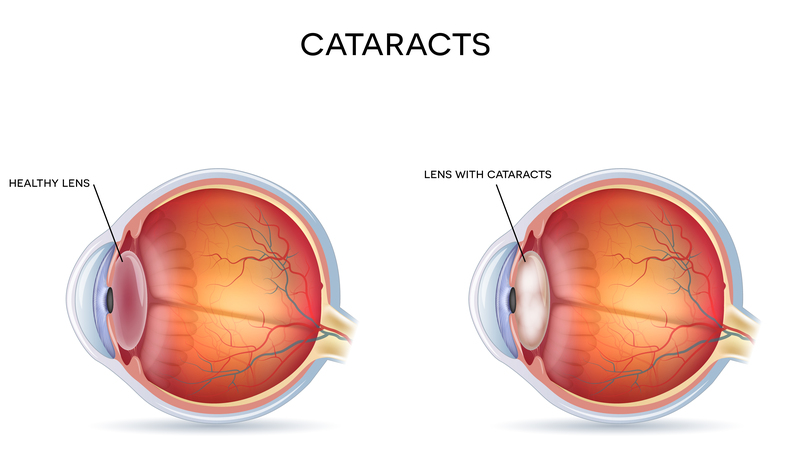 Learn more about how we treat cataracts, as well as what to expect if you need cataract surgery including lens implants. The first step to treating cataracts is diagnosing your eye condition. Our eye doctors in Chico use advanced technology to conduct eye and vision exams. During an eye exam your eye doctor will evaluate your vision and eye health, along with your medical history, to determine whether you have cataracts. Vision testing and eye function testing can help your ophthalmologist identify the degree of severity of your cataract. This is important for treating your cataracts successfully. We also take into account your current vision correction needs, as these may change if you treat your cataracts with lens implants. For cataract treatments in Chico the primary goal is to remove the cloudy lens that is causing vision issues. The clouded lens cannot be treated, but it can be replaced effectively using a lens implant. We offer several cataract surgery options including ReSTOR Lens implants and Rezoom implants. ReStore and Rezoom lens implants are multifocal, and they increase your vision. You may be able to retire your eyeglasses after getting these contact lens implants as they can provide you with corrected vision. As a result, you will need to undergo an eye exam after your contact lens implant surgery. This will provide you with an updated prescription for your new vision. When preparing for lens implants for cataracts, your eye surgery is completed as an outpatient procedure. The surgery is completed via an ultrasound-based system, which is noninvasive and expedient. During the procedure the cataract is broken apart and removed in small pieces. Since this is a noninvasive surgery you will not need stitches or extensive aftercare. Typically all that is required are eye drops to help prevent infection and treat inflammation. Recovery after cataract surgery in Chico is short, and you will be able to resume your normal lifestyle in a few weeks post-surgery. Whether you need an eye exam to test for cataracts or you are ready for cataract treatment via surgery, start by contacting our ophthalmologists in Chico, CA. Drs. Reeve, Woods, and Carter welcome you to Reeve-Woods Eye Center. We also offer extensive eye exams, glaucoma testing, contact lenses, and eyeglasses, as well as pre- and post-operative care. Contact our Chico office at 530-694-4040, to schedule your appointment for cataract treatment in California.